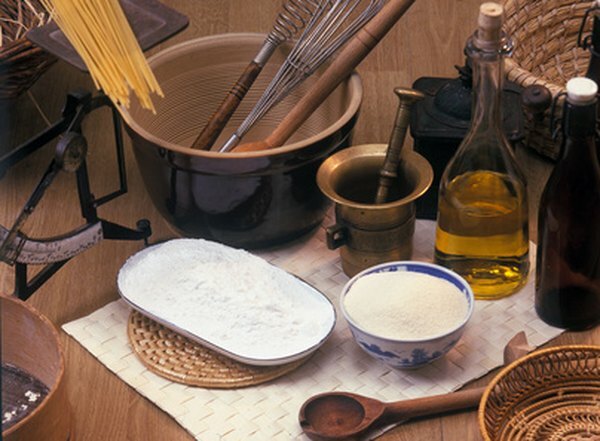 People with gluten intolerance must avoid a range of foods, from baked goods to pasta. Anything containing flour made from wheat may cause diarrhea, abdominal bloating and gas, vomiting and weight loss. If react adversely to gluten, consider replacing wheat flour in your diet with cassava flour, also called tapioca flour. This type of flour, made from the root of the cassava, contains no gluten. While this type of flour is typically course, processing advancements developed cassava flour to more closely mimic the texture of wheat flour, without adding gluten. A 100-gram serving of cassava flour – approximately 3.5 ounces – contains 340 calories. The majority of these calories, 94 percent, come from carbohydrates. Approximately 4 percent of the calories are from fat, and 2 percent of the calories are from protein. Cassava flour's contains high carbohydrate content means it serves as an excellent source of energy, and provides fuel to keep your brain functioning properly. Each serving of the flour offers 79.8 grams of carbohydrates, or 61 percent of the 130 grams recommended for daily consumption by the Institute of Medicine. Cassava flour also provides you with some protein, and it's low in fat. Each serving boasts 1.6 g of protein. While this amount helps meet your needs, supplement your diet with protein-rich foods to meet the suggested intake of 46 to 56 g per day. This protein nourishes your tissues and helps your maintain healthy muscle. One serving of cassava flour also contains 1.6 grams of fat. If you're looking to limit your fat intake, cassava flour makes a welcome addition to a low-fat diet. The fiber content of cassava flour makes this food a good choice for bowel health. One serving contains 11.9 grams of fiber. This makes up 46 percent of the recommended daily intake for women, or 31 percent for men, according to recommendations from the Institute of Medicine. Dietary fiber may lessen your risk of a variety of disease and conditions, including cancer, diabetes, diverticulitis and constipation. In addition, including adequate amounts of fiber in your diet can help you limit calorie intake – this nutrient takes up space in your stomach, making you feel fuller for longer time periods. One serving of cassava flour contains 417 milligrams of sodium. The American Heart Association recommends limiting yourself to 1500 mg per day to avoid elevated blood pressure and decrease your risk of heart attack and stroke, and a single serving of cassava provides almost one-third of this limit. Your body needs very little sodium to function but the average American consumes double the suggested limit, according to the U.S. Centers for Disease Control and Prevention. Limit your portion sizes when using cassava flour to avoid consuming too much sodium. Celiac.com: Will New Gluten-free Cassava Flour Rock Your Baking World?